Peterborough Police Amateur Boxing Club head coach Chris Baker certainly had plenty to celebrate at the Voyager Academy on Saturday night. He put together an excellent 12-bout show at the Walton venue for 200 very satisfield customers and also saw five of his fighters pick up impressive victories. Yet his proudest moment was watching young son Alfie make his ring debut. 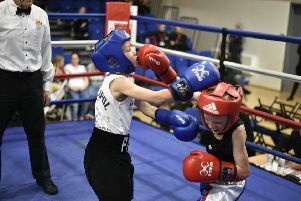 Alfie took part in his first skills bout the day after his 10th birthday and with the minimum age for a boxer being 10 years-old, Alfie almost certainly made boxing history by becoming the youngest fighter to step into the ring. He boxed a tough lad called Corey Topliss from the Empire ABC in Bristol and, encouraged by both parents in his corner (mum Vicki is also a qualified coach), the youngster acquitted himself very well indeed. He dominated the contest from the centre of the ring showing both skill and power and nearly stopped his opponent with body shots. Chloe Grigas (11), Ben Hutson (12) and Connor Dane (13) also starred in skills bouts for the promoting club before the competitive action got under way. And what a superb start it was for Peterborough Police as 11 year-old Imraan Shirazi thrilled the crowd in a 35kg contest with a unanimous points win against Hussain Zahid from the Jawaid Khaliq Boxing Academy in Nottingham. Shirazi quickly found his range and peppered his opponent throughout the three rounds with some awesome combinations to the head and body. Shirazi also won the boxer of the night award chosen by show sponsor Stephen Pinner. Pushing him close for that prize must have been Danny Coupe. The 16 year-old home fighter, a finalist in the national Development Championships earlier in the month, boxed East Midlands 75kg champion Milo Gallagher from Exhall Boxing Academy and turned in a very polished performance to win easily on points. The other three Peterborough Police winners were Artur Tomasevic, Dan Meins and Kieran Cocker. Heavyweight Tomasevic boxed Faizan Ali from the Jawaid Khaliq club and found him a difficult target to hit early on. But eventually Tomasevic got the measure of his tricky opponent to connect with enough clean shots for a unanimous point win. In fact, Tomasevic came very close to an inside-the-distance win when forcing Ali to take a standing count of eight in the third round with smashing right hands and body-crunching left hooks. Meins (30) was too strong for Kyle Birkett from the Arnold School of Boxing in a 69kg match-up while middleweight Cocker (20) won every round in a toe-to-toe punch-up with Dan Warren from the Jawaid Khaliq club. Two other Peterborough Police boxers were on the bill. Middleweight Awais Ahmed (17) lost to Alex Kamara from Bulmershe ABC on points while lightweight Imran Aref (16) was unlucky to see the decision go against him in a very tight affair against Percy Taylor from Exhall Boxing Academy.